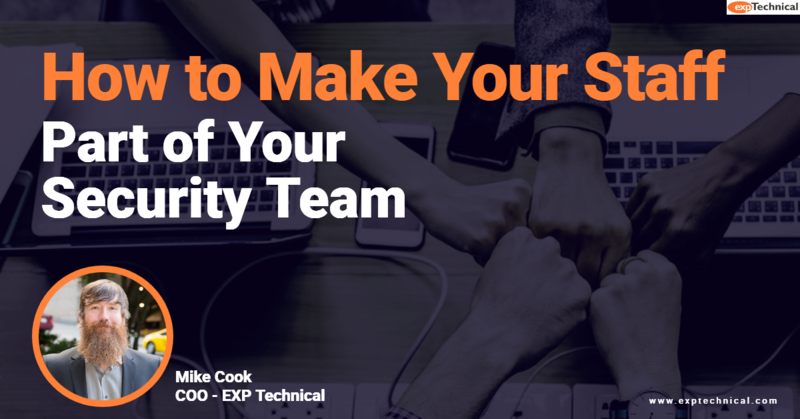 There is a direct connection between your company’s security and productivity. How? The more technology downtime you experience, the less time you have to get your work done, and the less available you are to your clients and customers. But here’s the good news: with training and diligence you can turn your employees — all of them — into valuable members of your security team. 1. Create and maintain an employee education program. Consistent and repetitive user education is paramount to network security. This helps identify employees who need more training or information regarding security awareness. But it’s not a one-time effort; it’s a process. Regular training sessions help ensure that awareness and education remain high among all staff members from the newest hire to the most senior employee. These programs are easy to set up, deploy, and sustain and we’re happy to walk you through it if you need help. 2. Always have a plan B ready. And ideally a plan C if possible. Secure environments are ever changing, and solutions that worked yesterday can be breached today. This means you need to stay on top of emerging and evolving threats using a multi-pronged approach to protection and recovery. Your approach and options will vary depending on your infrastructure, business workflows, and budget, so it’s critical to revisit your plan regularly. Doing so helps you assess your current risks and adjust your mitigation and prevention plans as necessary. And whenever possible, be sure to employ multiple recovery options in case data is encrypted by a third party. For a chilling example of what can happen if your employees are unable to spot a potential hacking attack, watch this video by EXP partner KnowBe4. It shows exactly how ransomware can potentially infect your Office 365 email and encrypt all your messages. And it all starts with an employee clicking on an innocent-looking link. Threats like these are why EXP uses tools from the security awareness experts at KnowBe4 to train users to act as effective gatekeepers against phishing attempts instead of unwilling facilitators. As the old saying goes, “an ounce of prevention is worth a pound of cure.” EXP can create a program to educate your staff, thereby securing your data and improving your productivity. And did you know there are many ways to back up your critical Office 365 data as a failsafe?